The Original photo I found! Diabolis in Musica in Bolton in 2009 for the Society for Creative Anachronism. I was looking for a picture to go with my article “Confession is good for the Soul,” which exposed that I had found a historical anachronism in my first Regency Romance novel, “The Fencing Master’s Daughter.” So far despite posting that article, no-one has identified the mistake I made. There is a small prize of an Ebook copy of my second book, “The Marquis’s Mistake,” for the first reader who informs me correctly what that error was. I was very conscious of the problems of finding images where I’d not be upsetting anyone’s copyright. Not wanting to make any other writing faux pas! My own publisher had mistakenly ascribed my cover for the “Fencing Master’s Daughter”, to their house artist, despite promising to give my friend, the real artist, Sarah J. Waldock credit, her links are:-( https://www.facebook.com/sarah.waldock.7?fref=ts,http://www.amazon.com/s/?ie=UTF8&keywords=sarah+waldock&tag=mh0b-20&index=digital-text&hvadid=3010406584&ref=pd_sl_68zo1iwmqk_e .) You can see her cover design for my book if you scroll through my articles. The matter of copyright has finally been sorted and now the correct cover artist is named on my book. I’d also been seeking some images for a possible trailer for the book, which a Facebook friend had offered to make for me. 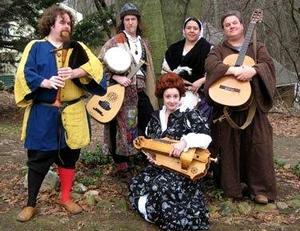 During my search I came across a group of musicians in brightly coloured medieval-style dress, one of whom anachronistically displayed a modern guitar. The group looked fun as if they were out to enjoy their music and have fun. I thought the picture would look good with the article. 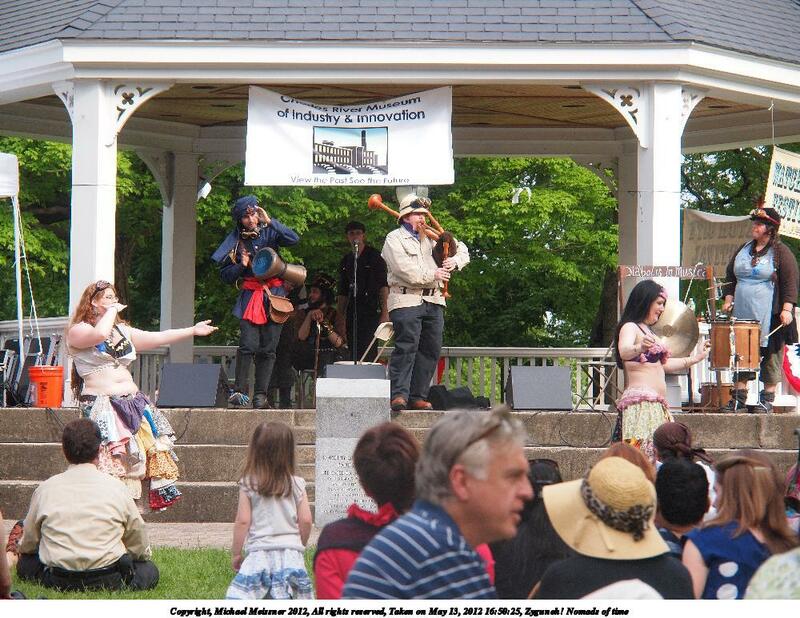 So trying to do the right thing, before using a picture of these jolly looking minstrels, I located an email address for one of their number and I send her an email asking if I could use their picture for my article on anachronisms. So I sat on my article for over 24 hours, while I waited for a reply. None was forthcoming so I found another couple of images to go with the piece. I found a picture of a sea monster from an early map which looked decorative, but definitely never existed and a lovely picture of an early balloon ride. There was nothing particularly anachronistic about the balloon picture, but I suspected it had been used by an earlier artist as the model for another writer’s cover. Again no historical inaccuracy, except the picture was about 50 years later than the period in which the book had been set. The artist had cunningly back dated the costumes of the surrounding people but the balloon was out of time. There had been balloon rides in the book’s period but their appearance might not have made such an attractive picture. So now I had a new problem, I’d published the article on my mistake and had not used the picture of Diabolis in Musica. But I’d sort of promised to use their picture. Which explains why I’m writing this article, so “Diabolis in Musica,” this article is for you and I hope it gets lots of readers so they listen to your music, which I’ve been doing while writing this! Their links are found at www.diabolisinmusica.com and www.zyguneh.com. I understand they may be making some changes in their line-up and aims but their music was an interesting mix of medieval accuracy with a rollicking beat. If I understand their web sites correctly they are adopting the new name “Zyguneh!” Listening to them rendering a song in Latin in a strong American accent added to my enjoyment. My email was signed Sioux Gerow, which compounded my joy in their unique style of music. 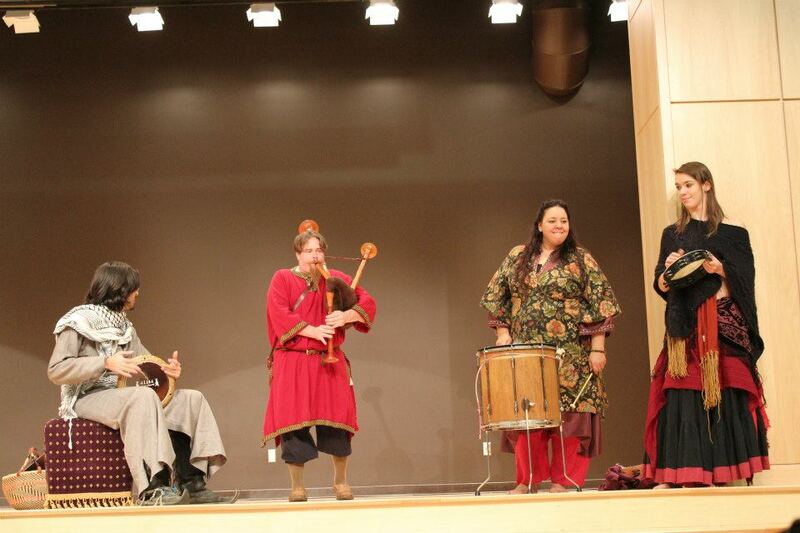 Because the concept of someone with an American Indian stage or real name playing medieval music rather tickled my fancy! 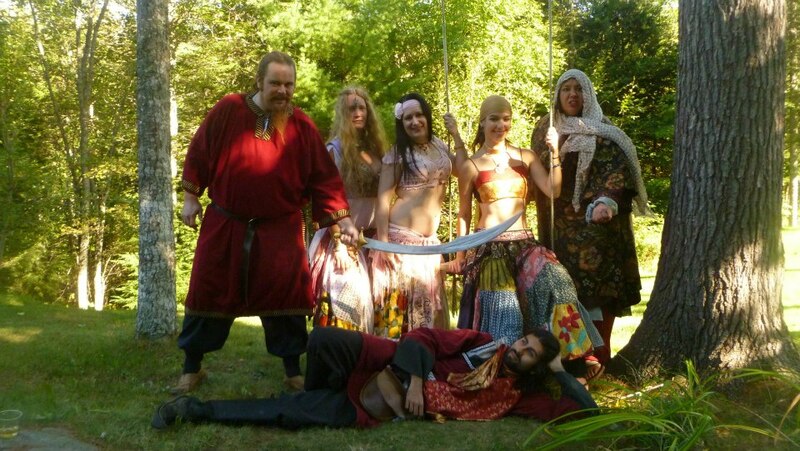 Here is what they say about themselves:- “Medieval and Middle Eastern inspired, high energy music, humour and a bunch of wonderful gypsy dancers to add just the right spice. A great band for many different events. We can provide small acoustic performances or loud electronic shows. Outdoors we have our colourful vardos, based on traditional bow-top gypsy wagons and the opportunity to provide fire-dancers. I apologize for changing their American spelling to that of UK for the purposes of consistency in this article. So I hope this pays my debt to Zyguneh or Diabolis in Musica and wish them every good fortune in the future. If they want to pay me back I’d appreciate a CD of their music to play while I write, because it is outrageously delightful! And if they wish to use any part of the blog for publicity purposes I waive copyright to them! In the meantime, I wait for someone to inform me they have found my blunder in “The Fencing Master’s Daughter” and claim their copy of “The Marquis’s Mistake.” I am hoping that book will be released before the end of the month and so far I have not discovered any historical inaccuracies. Time will tell whether my research this time has been sufficient to prevent further mishap. I rather enjoy it, just the sort of thing to write to!